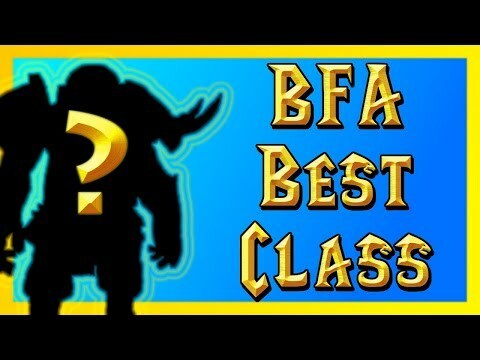 In this video I discuss what class I believe will be the best to play in BFA. I go over a scoring system which is what i used to measure what the best class would be. However just to simply state it, Rogue, in my opinion will be the greatest class in BFA. Outlaw has had many changes in BFA and is much simpler to play. The other two specs are still great but Outlaw is where the fun is. The scoring is based on Ease of Play, PVP, PVE (Mythic+, Raids), Solo Play and Fun. And the rogue for me scored very high here. Outlaw is very easy to play, thanks to the changes to energy regen and Blade Flurry. In pvp of course Rogues are always a powerful class, especially since in BFA, War Mode World PVP is important. PVE Mythic+ dungeons favor melee heavily. But in raids, rogues are much less in demand. Solo Play is prolly best on rogue compared to any other class unless you take into account survivability from tanks. And lastly fun, and rogues are VERY FUN. This is why i back my decision of rogues being the best class to main in World of Warcraft: Battle for Azeroth. Overall goal is to answer the question, what should I main? Best class in bfa? Patch 8.0 will be here soon!